These words send shivers down my spine, even though I had previously heard them from Professor Stefan Merl of Germany. Cheka officers mobilized starving poor peasants to conduct searches in the households of their better-off neighbors, and the former agreed under pain of death, either from starvation or being shot. How can one say that Ukrainians destroyed Ukrainians and therefore the crime does not fall under the UN Convention? What happened to those Cheka officers- the ones who were following orders from the Kremlin authorities? I have another question for Khmelko: why do you mention only the confiscations that involved poor peasants? When all the food was gone, people began eating each other. Mind you, those were people of the same ethnic origin, often relatives and close ones. We, historians, are reluctant to expose the thousands of cases of cannibalism found in archival documents to the public eye (to spare the public) and when we have to publish these documents that mention cannibals, we use initials rather than full names (to spare the family). But I will tell you what has constantly lingered at the back of my mind since the early 1970s: a senior colleague of mine, when he was in a certain mood and in a certain situation, told me that in his village everybody knew who had eaten whom in 1933. Returning to the thesis about the destruction of the Ukrainian peasantry, I will say that it should not be interpreted in an excessively narrow way — as the destruction of Ukrainians or the destruction of peasants. Is it conceivable that the Soviet authorities hunted down people only because they were peasants? After all, after he engineered the brutal famine, Stalin began, through Postyshev, feeding people — peasants and Ukrainians. No, an analysis of the Holodomor taken out of its historical context is utterly fruitless. The Holodomor cannot be viewed in isolation from the persecutions of the Ukrainian intelligentsia and Ukraine’s Communist Party. Before 1991, who among us perceived Ukraine as an independent country that had treaties with other countries and was able to leave the union at any moment? We lived in a centralized country divided into voiceless republics. This lack of voice was caused by their conformity to dictatorship from their birth. No one, except for certain dissidents, thought of defending Ukraine’s constitutional right to leave the USSR, nominating an alternative candidate for elections to a governing body, or publicly mentioning the 1932-33 famine, which everyone knew about. The US Congressional Commission on Ukraine’s famine asked all eyewitnesses the same question: why did Stalin destroy you? The overwhelming majority responded that they were being exterminated as Ukrainians. What other hypothesis could poorly educated peasants come up with? However, this conviction grew stronger in the diaspora and after 1991 it also spread in Ukraine. James Mace, the young American researcher of Ukrainian national communism, held a different opinion from the start. He was the first post-war scholar to confirm the fact that was clear to the German diplomats who witnessed the Holodomor: Stalin’s terror in Ukraine was not directed at people of a certain ethnic origin or occupation. Rather, it targeted the citizens of the Ukrainian state that had come into being after the breakup of the Russian empire and survived its demise in the form of the Soviet state. Mace formulated this thought long before he became executive director of the US Congressional Commission on Ukraine’s famine. At the 1982 international conference on the Holocaust in Tel Aviv he first called the 1932-33 Ukrainian famine an act of genocide and formulated the goal of Stalin’s terror by famine: to destroy the Ukrainian nation as a political factor and social organism. The same formula is contained in his paper presented at the first international conference on the Ukrainian famine of 1932-33, which was held in Montreal in 1983. When the Verkhovna Rada was considering the Holodomor-as-genocide bill, the Presidential Secretariat supplied each MP with a sizeable folder containing evidentiary material. However, the record of parliamentary proceedings showed that the efficiency of this material proved rather low. The bill barely scraped through. One can, of course, call this a glass half-full or half-empty, and paraphrase the above statement like this: the MPs were presented with convincing proof of genocide, which resulted in a rift in the anti-crisis coalition and caused the Verkhovna Rada to pass a bill that was distasteful to the Party of Regions and Russia. One thing is beyond doubt: for this law to gain international recognition, the Holodomor problem has to be depoliticized. The main thing is that the evidential basis for the Holodomor does exist. It only needs to be conveyed in the form of a dialogue. The party that disagrees with the Holodomor’s qualification as genocide has to be convinced. The party that insists on the fact of genocide has to abandon the myths that have surrounded the Holodomor problem from the start. One of the most vulnerable myths is the claim about the Holodomor’s death toll. Suggested figures contradict the facts, and political players who appeal to the international community to recognize the Ukrainian Holodomor as genocide are unwilling to acknowledge these facts. The exact victim count for the 1921-23 and 1946-47 famines will never be known because in both cases the Ukrainian people starved after prolonged military operations on their territory. We do not know who died during the war, who emigrated, and who settled on Ukrainian territory. In contrast, an approximate calculation is possible for the 1932-33 famine thanks to the solid foundation provided by the 1926, 1937, and 1939 all-Union censuses. With the data on natural population movements and population transfers, it is fairly easy to calculate the number of abnormal deaths caused by the famine and its accompanying pandemics. The people who were in charge of the 1937 census were persecuted because they failed to explain the catastrophic drop in population. The census was repeated in 1939 but its results, with the exception of the total figures, were not published. All the demographic statistics from the early 1930s were sealed and became available to researchers only in late 1989. In these conditions experts were only able to provide rough estimates, which could vary greatly. One of the first estimates of scholarly value was made by the prominent Ukrainian geographer and demographer Volodymyr Kubijovyc-2,500,000. In 1950 the newspaper Ukrainski Visti (Neu Ulm, Germany) published an article by S. Sosnovy, a person who was very far removed from demography and who suggested the figure of 7,500,000. He did not explain why his estimate was three times greater than Kubijovyc’s, but said that at the peak of the famine in the Ukrainian SSR 25,000 people were dying, i.e., over 1,000 people an hour, or 17 persons every minute. Under the pseudonym ‘Petro Dolyna,’ Dmytro Solovei presented his calculations in the first collective monograph on Stalin’s persecutions in Ukraine, which was published in 1955 by emigres in Toronto. A twofold victim count was offered: direct losses (4.8 million people) and cumulative losses (7.5 million), which included the drop in the birth rate. The calculations were based on a formula with compound interest, which is not suitable for a demographic analysis. But no one seemed to be disturbed by this. Vasyl Hlushko used these figures in his book on the Ukrainian famine published in English (Toronto) and Ukrainian (Detroit), both in 1983. From there they were borrowed by Deputy Minister Mykola Zhulynsky. 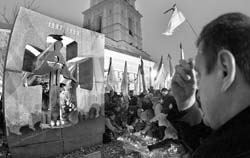 He headed the organizing committee of an international conference (Kyiv, Sept. 9-10, 1993) on the occasion of the 60th anniversary of the Holodomor. The data that were thus authorized by Zhulynsky are frequently used today. During the parliamentary hearings on Feb. 12, 2003, Dmytro Tabachnyk mentioned a figure that seemed most plausible to him — seven million people. James Mace said that in 1985 the UN was preparing a report on genocide. 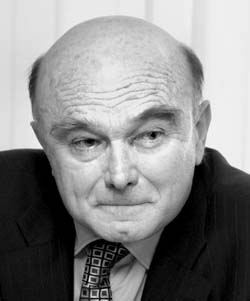 When he appealed to the rapporteur Whitaker to include the Ukrainian famine of 1932-33, the latter replied: “Since only 3 million Ukrainians were affected, i.e., no more than 10 percent of the population, the event does not merit the definition of genocide.” (The Day, Nov. 22, 2003). This was a UN official’s personal estimate that would have discredited the organization had it been made public. Nevertheless, a trend toward increasing the victim count became a way of drawing international attention to the Ukrainian tragedy. In his address to the UN General Assembly on Sept. 24, 2004, Leonid Kuchma said that in 1933 between seven and ten million Ukrainians died as a result of the famine engineered by the totalitarian regime. He added that the Soviet Union was selling grain abroad at the same time as 17 people were starving to death every minute in Ukraine. Viktor Yushchenko sticks to the figure of 10 million in his public references to the famine victims. Preparing the evidential basis for the bill on the Holodomor as genocide, Ihor Yukhnovsky was reluctant to specify the figure without backing it up with figures. He borrowed a simple way of deriving an estimate that was used by the 1988 international commission of jurists to provide qualification of the 1932-33 famine in Ukraine. The commission juxtaposed the difference between the data for the USSR’s population in the 1926 and 1939 censuses (a 16 percent increase, from 147 to 170.6 million) and the same data for Ukraine (a 9.9 percent decrease, from 31.2 to 28.1 million). Had Ukraine’s population increased at the all-Union rate, in 1939 it would have reached the 36.2 million mark. The difference between the actual and projected figure was 8.1 million. This is what Yukhnovsky, following the commission, equated with the death toll from the Holodomor. In fact, this is just a rough estimate of Ukraine’s cumulative losses during the 12 inter-census years. It includes direct and indirect losses (caused by the decreased birth rate) related to the famine, the negative balance of population transfers, as well as mistakes that stemmed from the mismatch of the real volume of natural population movements in Ukraine and the all- Union figures that were adopted for these calculations. A question arises: have researchers still not bothered to look at Soviet demographic statistics that have been available for the past 17 years? In March 1990 I flew to an international conference in Canada via Moscow. The head of the USSR’s Central Economic Archives allowed me to work in the archives for several days. I came to Toronto with a pile of statistical information and made an offer to two world-famous demographers to write a joint article on Ukraine’s losses caused by the 1932-33 famine. One of them was Stephen Wheatcroft, a Melbourne University professor, and the other was Aleksandr Babyonyshev, a Harvard University professor and former dissident from Moscow, who was close to Andrei Sakharov and used Bulgakov’s pseudonym, Maksudov. Maksudov’s Russian- language book Demographic Losses of the Population of the USSR was published in the US in 1988. Maksudov helped me sort out some of the purely demographic conundrums, and I quickly submitted my calculations to a 1990 collection of archival documents, which had to obtain special permission from the Politburo of the Central Committee of Ukraine’s Communist Party in order to be published. In early 1991 Ukrainskyi istorychnyi zhurnal published an article that I wrote with Maksudov. My calculations showed that the direct losses amounted to 3,238,000 people, and if corrected for inaccuracies in the population transfer data-between 3 and 3.5 million people. The cumulative losses (with the decreased birth rate) totaled five million people. Maksudov refused — without proper justification, in my opinion — to take into account state statistics on population growth owing to migration, and his estimate of direct losses was in the range of 4 to 4.5 million and cumulative losses, up to 6 million people. Serhii Pyrozhkov, an academician and the head of the Institute of Demography and Sociological Studies at the National Academy of Sciences of Ukraine, used an entirely different method that is suitable for calculating only the cumulative losses between 1926 and 1939. He published his results in 1992-5.8 million people over a 12- year period. It seems to me that this estimate is closer to my figure than to Maksudov’s. In answer to a question from the editorial office of Ekonomicheskie izvestiia, Pyrozhkov said on Nov. 24, 2006, that the direct and indirect losses caused by the Holodomor in Ukraine amounted to 4.6 million people. This result follows from an analytical work published by French demographers, who studied Soviet statistical data over a long period of time. Wheatcroft refused to sign the article that Maksudov and I had written. To me it seemed that the conscientious researcher that he was, Wheatcroft was frightened by such a high victim count, which was yielded by an unbiased analysis of statistical sources. However, in the appendix to a documentary collection entitled The Tragedy of the Soviet Village (Moscow, 2001) he published his own estimate of direct losses: 3 to 3.5 million in Ukraine and 6 to 7 million people in the USSR. In other words, this count matches the results published in 1990. In conclusion, various estimates of the Holodomor death toll in Ukraine, which were made at different times and using different methods of interpreting demographic statistics, produced roughly the same results. The statistical data are accessible and have already been published both in Ukraine and abroad, and the calculations are easy to verify. In public addresses to Ukrainian and foreign communities, Ukraine’s official representatives would be better off refraining from citing the figures that were first published by the Ukrainian diaspora in the 1950s. The evidential basis of the genocide has to rely on the results obtained by academic institutions in Ukraine. I would like the people who intend to complete the process in the UN of legally defining the Holodomor as genocide to heed the arguments presented in this long article. I also want those who are up in arms about this plan, which they perceive only as a way of gaining a political edge, to feel the utter horror of what happened in our country in 1932-33. We share this one country and we need to share one view of the Holodomor. The humiliation of turning it into a “forgiven Holocaust” should be sensed by everyone. A year ago the Web site www.anti-orange.ua featured an article by Myroslava Berdnyk, a journalist close to Natalia Vitrenko. The piece was prompted by the state- approved measures on the Day to Commemorate Holodomor Victims. The author resorted to making vile remarks about Yushchenko’s efforts to have the Holodomor acknowledged as genocide. But what struck me was the beginning of the article. I think it would affect everyone. I believe Berdnyk belongs to a younger generation than mine because I lost a grandfather in 1933. Despite the difference in age, she perceives the past as it is portrayed in Soviet history textbooks. Her awareness of the Holodomor has remained locked within the limits of family lore. There is no doubt about the causes behind this phenomenon: this information was politicized and thus not convincing. Myroslava quotes these lines and adds a caustic comment: “In this fashion the count of missing Ukrainians may be extended to the battles of Rama with the Rakshasas because some pitiful scholars believe him to be a proto-Ukrainian.” But we are not talking here about the Trypillians and Indians. Rather, we are discussing the 20th century, which in our families has not yet become the distant and abstract past. Myroslava’s great-grandfather is standing in front of me.